Future Hurricane Matthew (Maybe) And Me. The moment I waited for all of this hurricane season arrived late this afternoon. This satellite pic shows my namesake Tropical Storm Matthew coming to life in the Caribbean Sea Thursday afternoon. 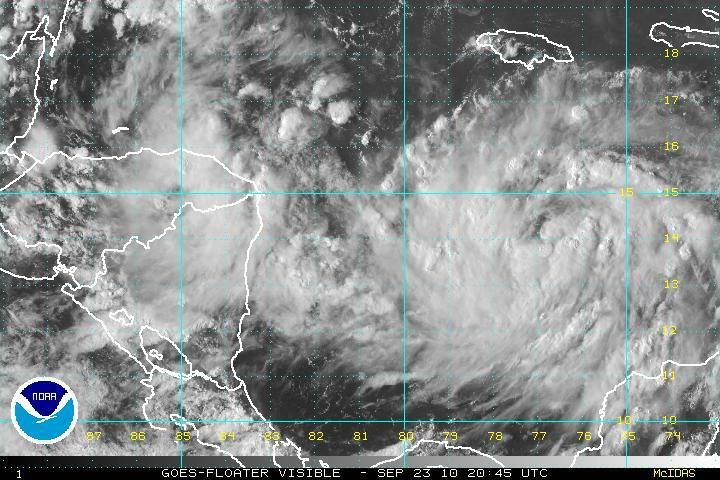 The National Hurricane Center declared that a swirling mass of thunderstorms in the Caribbean Sea strengthened enough to become Tropical Storm Matthew. It has the potential to turn into a nasty hurricane. But just a potential. It could also fizzle. I’m excited about the arrival of Tropical Storm, or maybe in the future Hurricane Matthew because I’m such a weather geek. And we weather geeks just LOVE exciting weather. Tropical Storm Matthew is just like me: It’s big, erratic, has potential to grow, it could make an impression and nobody is sure where it’s headed. Tropical Storm Matthew at least has the good sense to pick a nice place to visit: The Caribbean, rather than some God-forsaken place like Houston. Some forecasters worry that slow-moving Matthew might cause dangerous, fatal flooding in Nicarauga, Honduras and Belize, and I’d hate to see this thing kill anybody. With any luck it will stay safely out to sea. Some of the computer models bring Matthew ashore near Puerto Cabezas, Nicaragua, which has a sister city arrangement with Burlington, Vermont. Message to the mayor of Burlington: Don’t blame me if this storm trashes Puerto Cabezas. I have noting against Nicaragua. A few forecasters think Tropical Storm Matthew might turn north toward the Gulf of Mexico, and if it stays over water, it can turn into a strong Hurricane Matthew. I don’t know what to think about that. Does the Gulf Coast really need another disaster? This entry was posted on September 23, 2010 at 11:57 pm and is filed under Uncategorized. You can follow any responses to this entry through the RSS 2.0 feed. You can leave a response, or trackback from your own site.